Obverse: Laureated and draped bust of King George IV "GEORGIUS IIII DEI GRATIA" (George IV by the Grace of God) with the date 1826 below the bust. Reverse: The figure of Britannia, helmeted, and seated upon a rock, her right hand resting upon a shield, and holding in her left the Trident. Legend: "BRITANNIAR: REX FID: DEF:" (King of The British territories, Defender of the Faith) Exergue: A rose, thistle and shamrock intertwined, instead of a date, with edge plain. Obverse and reverse bust designed by William Wyon. References: KM# 693, Sp# 3823. There were three different reverse varieties for 1826. One without a centre line in the saltire. One with a thin raised line and the third with a thick raised line. 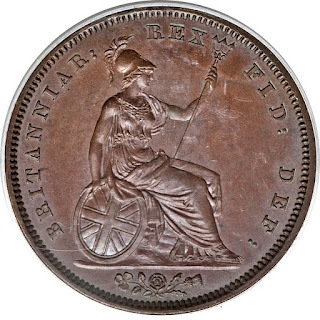 The 1827 Pennies are rare especially in higher grades because they were issued for use in Australia, and a lot were damaged by environmental issues like the sea journey over there by ship. 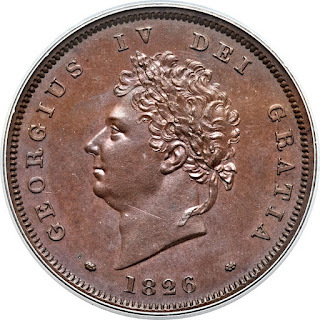 Halfpenny 1831 King William IV Halfpenny 1862 Queen Victoria "Bun Head"